A NASA-funded team found the first organic molecules thought to be of Martian origin. The public perception of intelligent design is that it is a scientifically specious, religiously motivated idea that seeks to explain away the notion of Darwinian evolution through magical thinking. Some incarnations of intelligent design can fairly be described as such. The Creation Museum in Petersburg, Ky., with displays showing animatronic dinosaurs roaming through Eden, employs a pseudoscientific presentation of faith — and biblical text — as a counterweight to the voluminous scientific information supporting evolution. But there are other alternative ideas that can explain the origin of life on Earth. One needn’t be actively religious, or even reject evolution, to consider the possibility of intelligent design. That intelligence could have originated not on some spiritual plane whose existence can never be proven but simply elsewhere in the cosmos. Religiously motivated attempts at developing a full-fledged theory of intelligent design consistently fall short of the standards of academic peer review, which leaves the intelligent design movement with a collection of faith-based arguments that criticize mainstream science but offer no coherent alternative. Design proponents often have in mind a creator God that made the universe itself and all of life, although they disagree on how this happened. Did the designer set everything into motion by causing the Big Bang? Was a designer required to get the process of evolution started on Earth? Or were the species all created in their approximate current form, and the conclusions of evolutionary theory are simply wrong? Or perhaps a designer simply meddled with our biochemistry or geology, and we can find signs of this tinkering if we look hard enough. Modern science does offer a tenable theory of intelligent design, one that does not resort to religion or pseudoscience. When considering that humans were not far off from the technological ability to transport Earth-based life to other planets, astronomer Carl Sagan and his contemporaries hypothesized that extraterrestrial intelligent beings, if they exist, might try to do the same thing. From this speculation was born the concept that extraterrestrial intelligent designers are responsible for life on Earth. Biologist Francis Crick is best remembered for his co-discovery of the double-helix structure of the DNA molecule, which subsequently unveiled the universal code of genetics that unifies all life on Earth. Crick expressed his puzzlement over why life used only one form of genetic code, based on only a subset of available amino acids. Crick, and biologists since, could imagine alternative genetic codes based on known amino acids that could have also arisen during the stages of life’s development. For most scientists, this suggested that the genetic code shared by all of life provided survival benefits that outcompeted any other developing forms of life. But Crick took his speculations a step further and mused that the particular configuration of life’s genetic code might indicate the work of extraterrestrial designers. His attraction to this brand of intelligent design is based on a more general idea in astrobiology known as panspermia, which investigates the possibility that microbial life could be inadvertently transferred among planets through collisions with asteroids and meteoroids. Rocks from the moon and Mars are routinely discovered in barren places like Antarctica, and the turbulent environment of the early solar system could have led to an even greater exchange of material among the terrestrial planets. Many microorganisms are capable of surviving for long periods of time in extreme environments. which suggests that at least in principle, they could withstand a journey through space. Scientific study of panspermia since the discovery of DNA has generally confirmed that this process could work. The greatest threat to the survival of a microorganism on an interplanetary trip is reaching the surface of the destination planet without burning up in the atmosphere. Careful computational studies have shown that large, dense asteroids or meteors could conceivably keep microorganisms protected through an extended journey. Other factors, such as protection from dangerous radiation in space, seem to complicate the problem but do not necessarily rule out the possibility that microbial life may have been carried from Earth to Mars, or vice versa. 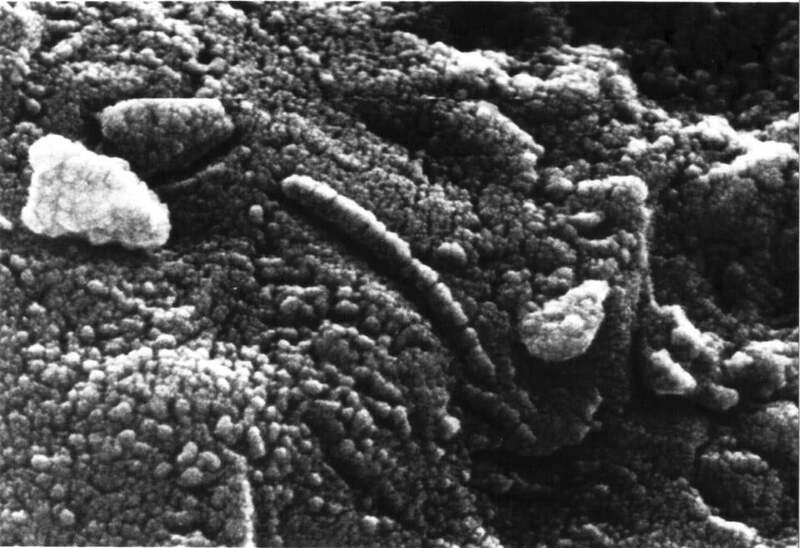 A team of researchers in 1996 announced that a meteorite found in Antarctica, purported to have originated on Mars, showed features with some structural similarities to microorganisms on Earth. Most of the scientific community has remained skeptical that the meteorite offers evidence of past life on Mars, in part because the structures, while visible only with an electron microscope, are much bigger than the terrestrial microorganisms to which they’ve been compared. Still, the idea that such evidence of interplanetary panspermia could exist, and may yet be discovered, remains possible. Interplanetary panspermia is a viable hypothesis. If signs of life are someday discovered on Mars, one of the first scientific questions will be to determine whether it actually originated on Earth and migrated by panspermia. Interstellar panspermia — undirected transfer of life between planets orbiting different stars — is wildly improbable, though. The distance between stars is vast, and Crick was well aware that any object sent out in a random direction “would in almost all cases pass right through the galaxy and out the other side.” Even objects like the Voyager spacecraft, which recently left the confines of the solar system, are destined to drift through the emptiness of space forever. Crick imagined that humans may soon have the capability to intentionally send exploratory space probes to nearby planets, and he suggested that we could deliberately spread microbial life to other worlds. A carefully constructed craft could shield and preserve a selected population of microorganisms on the millennial (or longer) voyage between star systems, eventually coming to rest on a planet suitable for the colony to take hold. Such a bold and long-term experiment is still beyond our ability to achieve today, but we could conceivably do this in the near future. Why would we want to seed the galaxy with microbial life? It would provide no direct benefit to humans, other than the knowledge that we have enabled Earth-based life to flourish elsewhere. We would want to be careful to avoid contaminating an already inhabited world. Crick suggests that we might someday consider this type of intentional panspermia if we have conclusive reason to believe Earth is the only inhabited planet in our galaxy. In such a scenario, spreading life to lifeless planets could represent a form of altruism. The unified code of our genetics suggested to Crick that extraterrestrial designers seeded life on Earth when our planet was in the early stages of formation. The motives of extraterrestrial designers could be similar; perhaps they observed themselves to be the only forms of life in the galaxy, or even the universe. Possibly this motivated them to sprinkle the beginnings of a prebiotic soup or microbial mixture on a scattering of planets that looked suitable for life but remained lifeless. Maybe, Crick and others suggest, Earth was one of these planets. Hoyle developed an even more elaborate hypothesis of directed panspermia in his 1981 book “Evolution from Space,” coauthored with astronomer Chandra Wickramasinghe. Expanding on the arguments outlined by Crick and others, Hoyle and Wickramasinghe concluded that life on Earth was seeded by intelligent silicon-based life forms, and that humans and the rest of life today progressed through an evolutionary history that was designed with extraterrestrial intentions. They point to the development of robotics and artificial intelligence and speculate that computerized silicon-based intelligences may have desired such an outcome. Perhaps these intelligent beings invented our biological code in order to diversify the forms of life they knew. Perhaps they are waiting for us to develop our own computer-based intelligences that can someday communicate with them. Hoyle imagines that life on Earth is not a statistical fluke but instead part of a greater cycle of evolving intelligences in the universe. Hoyle’s speculations admittedly border on — if not cross directly into — science fiction, and the ability to make testable and concrete predictions remains a critical demarcation of an idea with scientific merit. Establishing the identity of the designer as a robotic silicon-based intelligence is a difficult, but not necessarily impossible, task. Yet a search for some general evidence of directed panspermia does suggest a few avenues of inquiry. Crick and Hoyle held that the genetic code on Earth could provide clues to implicate extraterrestrial beings as the designers of life. A few scientists have argued that specific patterns in statistical analyses of genomic data might indicate that features of our genetic code were designed, which could add support to the directed panspermia hypothesis, although none of these arguments have been conclusive or convincing to the broader scientific community. Others have analyzed sequences in DNA for encoded messages, possibly inserted by intelligent designers as a calling card. No such patterns have yet been found. The premise of directed panspermia of course requires the existence of intelligence life on other planets. If Crick and Hoyle are correct in their premise that Earth is a less-than-ideal world for the origin of life, then we should expect to discover planets around other stars that seem to be better suited. We’ve yet to identify such planets, but our observational data set grows as space telescopes continue to advance. The search for radio and optical signals from extraterrestrial intelligent beings is another way to look. If life on Earth really did begin from the design of extraterrestrial beings, then perhaps we might someday establish remote communication with them. The recent $100 million Breakthrough Listen Initiative is one effort at addressing this question over the next decade. Further research on the origin of life is even more promising. Understanding the role of Earth’s environment in the formation of prebiotic compounds will better help humans determine whether Earth was suitable for the emergence of life. These topics and others all suggest a scientific direction of inquiry that could ultimately help to test the idea of directed panspermia. Directed panspermia is not the best explanation of the data available today, but it remains a scientifically grounded idea that implicates an intelligent designer as responsible for life on Earth. It makes no claims that attach it to any particular religion or creed. There’s no reason it couldn’t be taught in schools. We have nothing to fear from teaching a genuinely scientific theory of intelligent design in public schools. In fact, directed panspermia provides an excellent vehicle for students to understand the themes of astrobiology and the complexities of evolution. Let the students examine the evidence and decide for themselves which is more likely: origin of life on Earth, or origin from afar by extraterrestrial beings. Such an imaginative exercise will push students toward the frontiers of inquiry and inspire novel solutions toward a new, scientific theory of our origins.